Colouring, decoloration = Broken, dry and damaged hair? Not anymore! Thanks to OLAPLEX your hair will be smooth, shiny and healthy. Don’t resign from playing with colours. Hair care system OLAPLEX is applied during hair colouring in the salon. Dying, decoloration, straightening or even drying with hot air causes damaging of the hair tructure(breaking disulfide bonds). The result is dull, fragile and dry hair. OLAPLEX binds and regenerates disulfide bonds, eliminating drastic damage developed during chemical procedures. Hair become shiny, elastic and healthy..
To make the effects of OLAPLEX long lasting, No3 Hair protector has ben developed to be used between the treatments. It is a part of OLAPLEX system destined to use at home. It allows hair regeneration and protection after colouring, and protects the hair from the heat of dryer or straightener. The OLAPLEX system allows radical colour change. Thanks to OLAPLEX, famous celebrity Kim Kardashian could change her hair colour without any damage to the hair structure. None of the OLAPLEX products contains silicones, sulphates, phthalates, DEA, aldehydes or gluten, and has never been tested on animals. 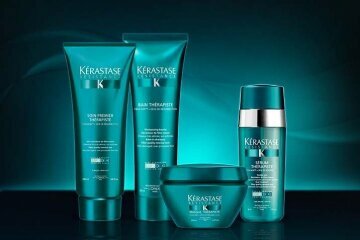 and is used to reconstruct hair after unsuccessful procedures. 1. After the treatment damaged and dry hair are smooth, soft and shiny. 2. Added to decolorating products keeps hair in good condition which allows to colour your hair for more than one tone. 3. After treatment healthy hair are even more smooth and shiny, and are easier to brush. 4. Olaplex creates bonds that help natural process of chemical hair reconstruction, what means that maximal effect of the treatment is visible after a few hours. The price of the treatment depends on length and density of hair, and is determined individually.